Lorena Ochoa has broken 70 for nine consecutive rounds and 15 of her last 17. Her scoring average is down to 67.87, 1.9 shots better than #2 Annika Sorenstam. She’s #1 in GIR, hitting them at 81%. Her average margin of victory, however, dropped from 8.5 to 7.4. The secret to beating Ochoa? Force her to play every week until she drops dead from exhaustion. 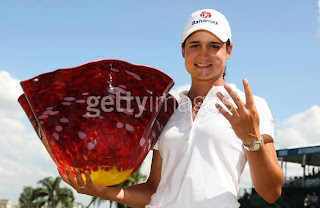 Mainstream media, listen closely – I appreciate all of the comparisons you guys are now making between Ochoa and Tiger Woods, even though those of us who follow such things closely realized that parallel before Lorena won four in a row. There is NO NEED to label someone as the “Phil Mickelson” to Lorena’s “Tiger”, Bobby Clampett. Go back to your preferred PGA gig and leave Suzann Pettersen alone. Yani Tseng has now finished second twice this year but despite the assurances of Bill Macatee, she is NOT the leading candidate for Rookie of the Year. Even after the Ginn Open, Na Yeon Choi leads the ROY points race 378-341. Give Yani credit - she stayed in the hunt longer than anyone (especially me) imagined, only really falling out when she bogeyed 15. From Larry’s Life On Tour – rumor has it that Ginn wanted to bail or even cancel the Tribute in Charleston next month. Since the event still seems to be on, I’ll withhold for now any venom about possibly ruining my vacation/on-course blogging opportunity. As Bill Jempty writes at Wizbang Sports, my current anger is over the LPGA’s snub of one long-time sponsor (ShopRite), over-committing to one Johnny-Come-Lately sponsor and now paying the price when the freaking real-estate market takes a nose-dive. Great move, Suzie. This one’s on you. Of all the accolades that Lorena has received in recent months, Val Skinner may have come up with the weirdest (maybe worst) – because of her charitable work at home, Lorena is now “the Oprah of Mexico”. I nearly lost my lunch. Candie Kung gets my Big Surprise Award this week with her first Top 10 finish since 2006. Teresa Lu’s tie for third earns a big shout-out and so does Carin Koch (with her second straight Top 10) and Russy Gulyanamitta (T17). My Big Disappointment is Maria Hjorth, who missed the cut after coming in with two Top 6 finishes.